The Unit 3 Student Interactive Notebook for the Reading Apprenticeship Academic Literacy Course contains writing prompts, graphic organizers, and resources for partner, small group, and individual literacy investigations. The Student Reader accompanying Unit 3: Reading Science of the Reading Apprenticeship Academic Literacy Course introduces students to a range of science texts, including textbook and other expository text, illustrations, lab directions, tables, graphs, trend data, and journalism all focused on the interrelated topics of nutrition, physiology, and health, with special attention to the obesity epidemic in the United States. 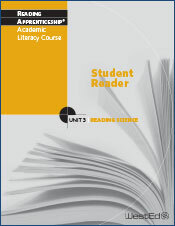 This third unit of the Reading Apprenticeship Academic Literacy Course introduces close reading of a range of science texts and genres. Readings focus on nutrition, physiology, and health, including special attention to the causes and dangers of obesity. Students continue to practice literacy skills introduced in Units 1 and 2 and add new strategies related to the reading of science texts specifically.